If you are using a Microchip uP you might want to continue reading. Here is the problem, Raspberry Pi’s I2C software can’t cope with slave clock stretching, not a problem if you can service the data request quickly, well you would have thought not anyway. Unfortunately Microchip’s hardware (using a PIC18F14K50 and many others) always puts in a small clock stretch for a slave transmit, even if you disable clock stretching with the SEN bit. A thorough read of the data sheet gives you a clue “The ACK pulse will be sent on the ninth bit and pin SCK/SCL is held low regardless of SEN“. So data transmission TO the PIC works fine (if you can deal with the I2C data quickly enough), but for Slave data transmit TO the RPI you get errors. 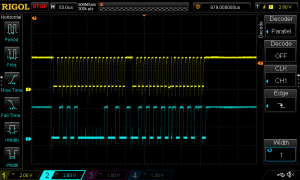 The problem is, they are random and depend on the exact timing of the I2C bus and uP speed. This clock stretch only happens after the address byte and before the transmission data. 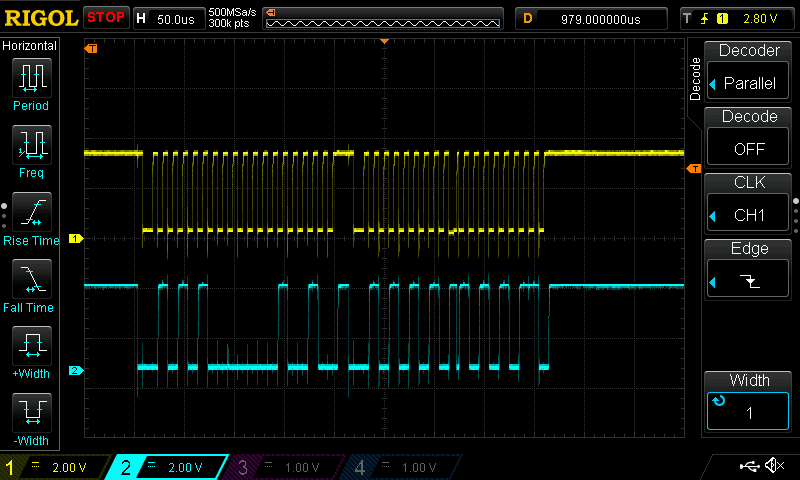 It causes a short or missing clock pulse (as the RPI ignores the presence of the clock held low by the slave) as in the transition of bytes 3 &4 of data in the oscilloscope capture below. So how do we work around this, well to be honest there isn’t a total solution. (that I’ve found) the best that I have achieved is to change the I2C clock speed so the timing of a clock stretch happens when the clock is already low and tweak the uP interrupt software. The clock speed change is unfortunately a trial and error process whilst monitoring the data (and probably watching with a scope). To change the I2C bus speed with a newer PI distro, you need to edit the /boot/config.txt and edit or add the line “dtparam=i2c1_baudrate=clockspeed” try clock speeds from 20000 to 400000 and follow by a reboot of the PI to make the changes active. The bus clock speed that will work will vary with the microprocessor speed, so there is no single solution. With my setup 200Khz and 50Khz works well (uP clock @32Mhz) where 400khz and 100khz is a total wright off. I have also changed the I2C code in the PIC18F14K50 to give a fast set of the BF flag after data transmission which helps minimise the clock hold time. With these changes, I have got (as the adverts say) up to 100% TX from a slave without error. This is about the best we can do until either Microchip change their hardware, or RPI write a I2C handler that supports clock stretch. With a 3.3v RS232 adapter connect earth and RX/TX to your PI. 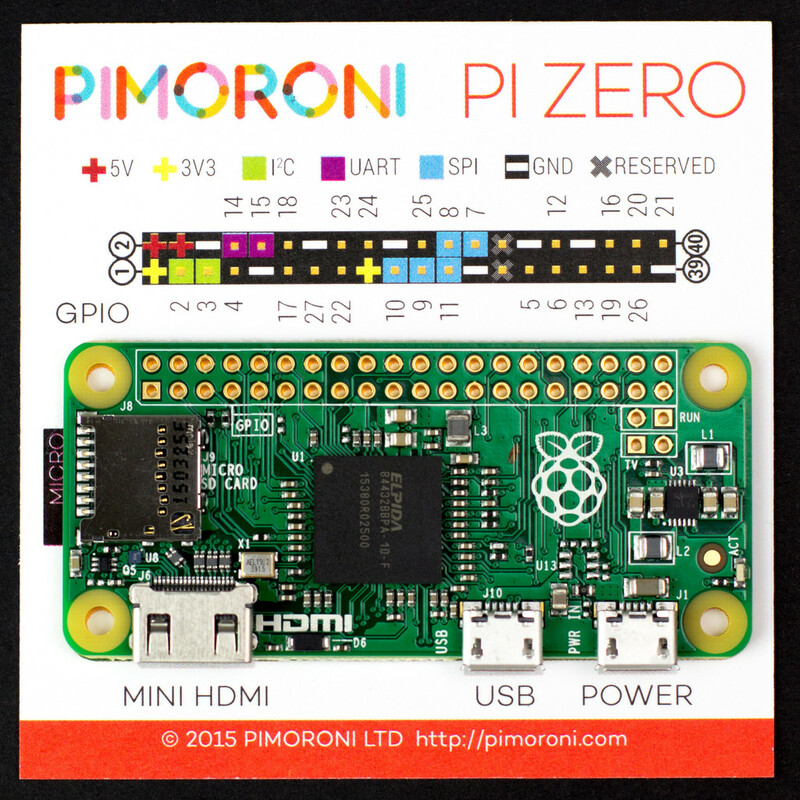 Be careful some adapters are only 5V and will damage your PI’s UART pins. Setup your PC (I use Tera Term) serial adapter for 115200, 7 bits, even parity, 1 stop bit. If you get a screen of gobbledegook then good, otherwise swap your TX and RX around. When the gobbledegook has finished, press return a couple of times, and you should get a login prompt. Configure your PI the usual way. 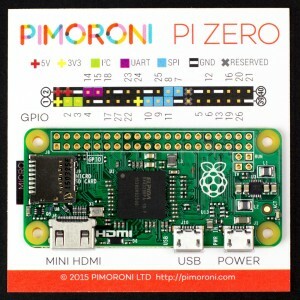 You will need some network to get your updates, but apart from that you have a working PI. 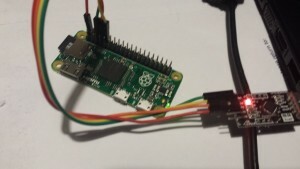 If you are brave (or idle) you can connect the +5v line from your serial adapter to power your PI too so you don’t need another usb power lead. Just be very careful that you attach it to the correct pins, otherwise your PI will be damaged. The baud rate is auto detected, the native speed is 115200 (amended above) The auto detection only happens at the login prompt. The auto detection won’t pick up changes in bits/stop bits/ or parity. You can change the console getty port/speed/parity settings look at RPi serial connection above. Couple of reasons for the purchase, Its was cheap, and it had a small processor and USB support out of the box. OK, 1 and 2 are true, 3 is a little more complex. After trawling the internet All I found was out of date information, information on the original Minimus board, or information using an old version of Atmels IDE. Having struggled in the past with old IDE’s I decided to use the newest one and brave it out. You can download Atmel’s latest IDE free from here [shortlink url=”http://www.atmel.com/microsite/atmel_studio6/” title=”http://www.atmel.com/microsite/atmel_studio6/”] It is a Visual Studio based IDE and looks pretty good. Unfortunately there is no support for the bootloader contained in the minimus32 board. I set the uP to ATMEGA32U2 hit build and It compiled first time. Went into Flip, loaded the .hex file and sent it to the Minmus32. After a little playing with the buttons it ran. It compiled, but wouldn’t run. Cutting a long story short there were a number of things wrong. 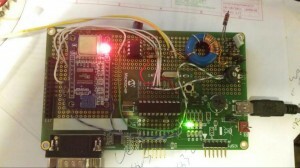 The Processor speed was incorrect, the target board wasn’t set correctly and the LUFA libraries didn’t contain the code specific to the Minimus32 Board. 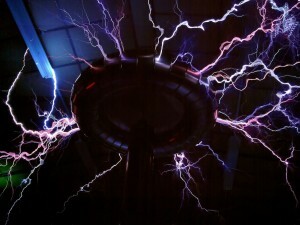 USE_STATIC_OPTIONS="(USB_DEVICE_OPT_FULLSPEED | USB_OPT_REG_ENABLED | USB_OPT_AUTO_PLL)"
First light of a Tesla Coil tuner. So I needed to get a better Tesla coil Tuner. I have been using this NE555 pinger for 10+ years. With some of the tuning problems I’ve had recently I needed a better solution. 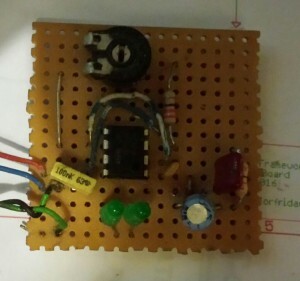 PIC powered USB controlled Tesla Coil Tuner using AD9850 DDS Frequency Synthesis. Direct connection to the Primary Coil with current measuring. Primary Cap and Secondary (across spark gap) – Should see both current dips. First plot of a small Secondary coil, using VB to drive the USB. I’m having some issues getting a plot with just a primary coil, not sure why at the moment. Also my driver (tc428) is damaged, its not driving correctly to ground. Which may be causing me some issues. But not bad for a first go. Improved the display, and removed a whole load of noise on the traces. 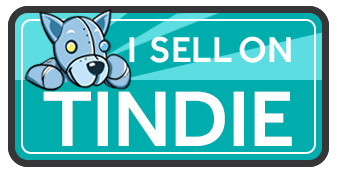 This shows a current scan in Dark blue, with a snapshot in light blue and the Ariel input in dark green with a light green snapshot. The current scan was done with my hand near the topload hence the lower resonant frequencies.